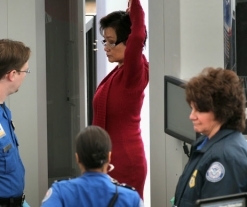 A cancer victim who suffers from incontinence was humiliated during an incident last week when a TSA agent loudly announced “he’s wearing a diaper” to waiting travelers, before laughing and subjecting the man to a strip search. The harrowing account of the man’s experience at the hands of everybody’s favorite federal agency is explained by his wife in a post over at CafeMom.com. 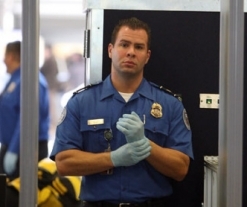 The man was told that “further review” of his diaper was required before being led into a back room with four TSA screeners who kept asking the man if he had liquid in his pants, seemingly unable to grasp the meaning of the term “incontinent”. After the man was forced to repeatedly explain that he had wet his pants due to his medical condition, TSA screeners subjected him to another pat down before asking the man to “drop his pants” so that they could see the “suspicious padding” around his waist. The man was then forced to change out into a separate adult diaper and the TSA agents confiscated his used diaper so that they could subject it to further scrutiny. After ensuring that the wet diaper was not an explosive item, the couple were finally allowed to leave and board their plane.